Who else is ready for spring? It's raining today in the Bay Area and all the stores have changed over to their spring weather collections, which has me lusting for spring more and more. This pretty lilac maxi skirt is one of the first pieces I've acquired in this sweet color. My favorite color is purple but ironically, I don't own many purple colored pieces. To be honest, I'm not much of a pastel color kind of gal (in terms of wearing the colors) so I opted to "edge" up the lilac skirt with a loose-fit nautical stripe shirt, black booties and a gunmetal color handbag. And that's how I'm wearing pastels lately. I am so ready for spring too! Lovely delicate lavender skirt! Really love this outfit. The color of that skirt is beautiful, and I love that necklace! This skirt is so pretty. The color is so spring and stunning! This outfit is so perfect for spring...it's totally making me crave a new season (and wardrobe change!). I am most definitely ready for spring! 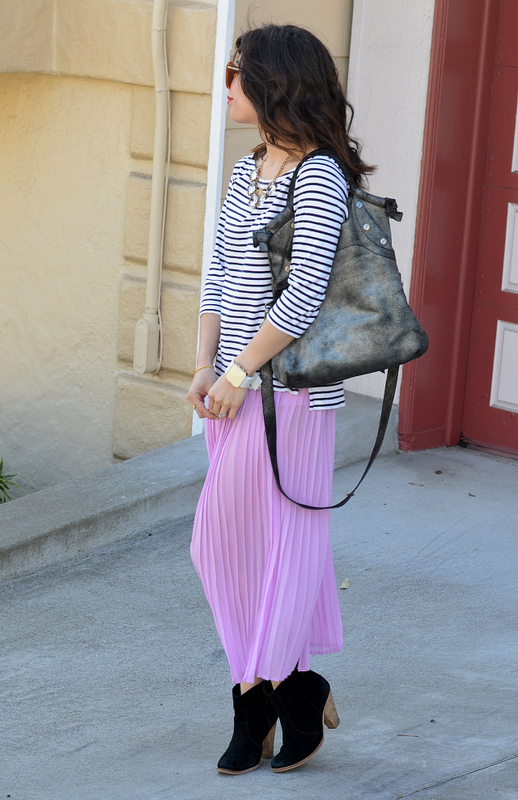 Loving the stripes and pleats! You're killing me this week! This and your other outfit from earlier this week are probably my favorite of yours EVER! This is so simple, yet so chic, you look amazing in this pleated maxi! Love the girly skirt with the booties! I am so excited for Spring, I can't wait for more shopping! Ah! I LOVE this color on you and it's just a great skirt! Might have to go over to F21 and pick one up! Lovely! LOVE this color on you; so fresh! Such a cute look! Love love love your skirt! Loving those jeans! I need to do my own diy! I love seeing a blogger re-work a piece. It's great to see how different the look is just by changing the shirt, adding a blazer, etc. Absolutely lovely! You look so comfortable & chic! Such a great mix! 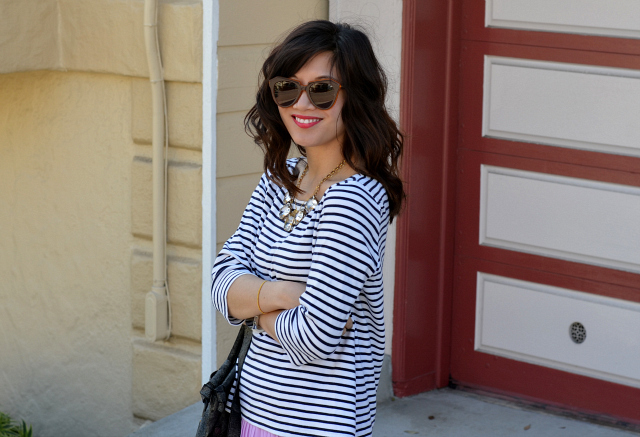 Totally obsessed with this outfit - the stripes and lilac work so well together! I love this look! I have that striped shirt and I'll have to pair it with my pleated skirt now! I'm so ready for spring! I LOVE this outfit! You always look amazing. I just thrifted a similar skirt recently, I need to recreate this look. I absolutely love the color of this skirt, it's so pretty. You look beautiful! i love the casual elegance of this outfit! *raises hand enthusiastically* I'm ready for spring! I love that pleated maxi skirt. It looks great with the stripes! Such a gorgeous skirt Nancy - love the color! And love that you paired it with stripes and ankles boots...so cute :) We are supposed to get 1-2 feet of snow tomorrow...definitely ready for spring! 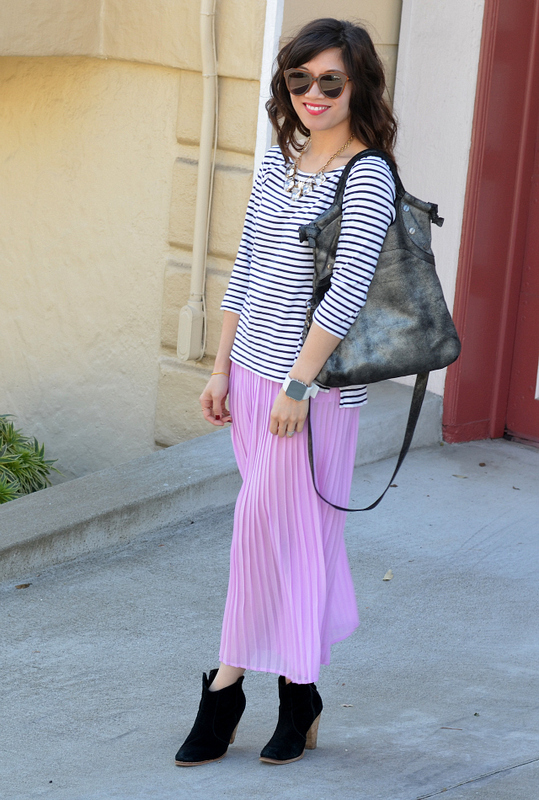 Love the lilac pick pleated skirt with the striped top. It is feminine & edgy at the same time! Stay dry this weekend - we are expecting some downpour this weekend. You definitely look ready for spring in this lovely, pale pink maxi! I'm ready for spring too...I want to start wearing skirts and shorts again! I love this casual chic sort of look--very pretty . . .
oh im loving the pleats toughened up with the booties! I am completely ready for spring! this lavender maxi is gorgeous! so f*****g cute!!! Sorry for my language but seriously, loving your looks lately - and this skirt is def. a keeper! You look so cute! And it's official I need to order a long maxi skirt asap!! Nancy!!! I would have never put these pieces together! I love that stylish mind of yours! The pleated skirt looks so cute with the booties:)! I want that skirt NOW! That skirt is so pretty! Love the color! I WISH I was getting ready for spring - right now I'm getting ready for a blizzard! I love that skirt though, that color is beautiful. I love how you added the booties! The shape and color of this skirt is gorgeous! I loved how you paired it with the stripes and boots. I too am SOOOO ready for spring! Love that pleated skirt! The color is pretty! Beautiful skirt! I love it paired with that classic top!